This post is a contribution to the Range Hoods Inc July Blog Hop & $50 Amazon Gift Card Giveaway. As a blog hop participant, we've been asked to write about Summer DIY & Home Improvement. Check out the link to read other DIY contributions, learn more about the blog hop, and a chance to win a $50 Amazon Gift Card. 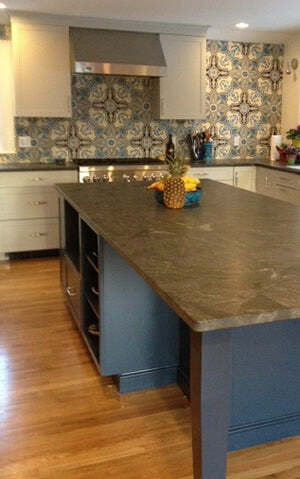 Patchwork designs create an eye-catching backsplash but take planning to achieve a balanced blend of color and pattern. Decide on the countertop you want first. 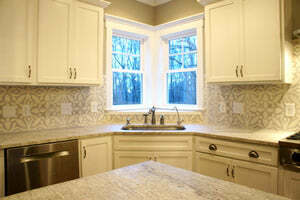 Then you can start talking tile and backsplash designs. Make sure the two complement each other. Don't draw attention away from a stunning counter with a busy tiled background. If the countertop is plain or simple, then let the backsplash be the focal point. Here are a few photos that show the "yen and yang" relationship of a counter and backsplash. In the patchwork above, bold colors and strong patterns are placed next to clean white cabinets and counters with stainless steel appliances and hardware. The backsplash is both eye-catching and appealing because the cement tile patchwork is the dominant focal point. Balance decorative pattern tiles in a backsplash with plain colors on the counter and floor. 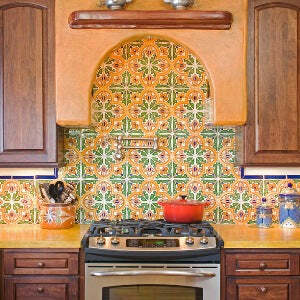 Above, a Spanish-inspired tile creates a bright and bold backsplash using Barcelona San Jose 6" x 6". The tile pairs nicely with a simple solid-color counter. 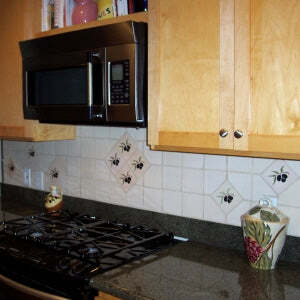 Small decorative accent tile or dots keep the backsplash interesting and don't detract from the handsome counter. The French cement tile backsplash pattern behind the stove below was customized to complement the colors in the granite counter and floor. The backsplash tiles provide the eye-catching focal point; but, the porcelain flooring and granite counter really support the overall color palette, style and feel of the design. Consistent color choice with the decorative tile, counter, and floor make this design work. Work with the available space. You can't fit 10 pounds of gold into a 5-pound sack. Large tiles with big patterns just don't work in that tiny wall space behind the sink with a big picture window - no matter how much you love that tile. It sounds obvious; but pictures make it very clear. 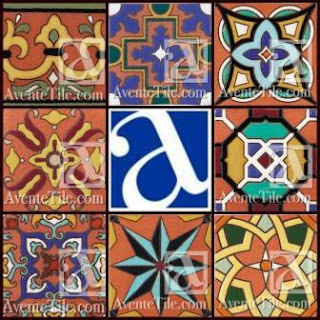 Above, Cuban Heritage Design 110 2B 8″ x 8″ cement tiles require eight tiles to complete both the cross and medallion pattern. It works well for a large wall with no cabinets. The same impact could not be achieved below. There is only 18” between the cabinets and counter. However, decorative tile placed randomly throughout the backsplash and grouped to form a medallion create a warm, Tuscan feel. Smaller tiles can be used randomly or grouped to create a medallion. Consider creating a mural with smaller, decorative tiles and frame with a lavish, textured molding if you don't have space for large pattern tiles. A framed tile murals below the range-hood accommodates the space perfectly. Define your style. A kitchen designer can really help. First, though, try to define the experience you want to achieve, the importance of aesthetics versus “ease of maintenance.” What colors do you like? Do you like clean lines and contemporary designs or classic patterns? Bright colors or muted colors? Vivid colors or earth tones? Here's a few examples of classic and contemporary styles that use tiles to define the design. Fruit, vegetable and flowers are a classic kitchen theme for a kitchen backsplash. Traditional cement tile patterns in hip colors work with this updated contemporary kitchen. If too much pattern scares you, consider "blocking tiles" to create one or two interest areas. As you find your style and look for tile, keep these three rules in mind and you will end up with an eye-catching backsplash that you’ll love for years to come. Don't miss the other posts that are part of Range Hoods Inc July Blog Hop & $50 Amazon Gift Card Giveaway. What are you waiting for? Get your chance to win a $50 Amazon Gift Card! The hot, humid weather we've been experiencing in Southern California since last week has taken a toll on me. I am not used to the tropical weather, so I find my mind wandering. However, with the stifling and oppressive heat, there is great news! We received some much-needed rain for our parched California lands. Also, as my mind continues to wander, I couldn't help but think of a getaway or vacation, so I thought I would share one of my favorite tile haunts here in California, The Workman and Temple Family Homestead Museum. The Moorish-inspired, Spanish door and entry of La Casa Nueva is meant to impress. The Homestead Museum is a hidden gem that resides in the most unlikely of areas, the City of Industry, just outside of Los Angeles. The museum is a place to explore the history of the Los Angeles region from 1830 to 1930 through the hopes and dashed aspirations of two families. The six-acre site features the Workman House, an 1870s country home constructed around an 1840s adobe built by William and Nicolasa Workman. Additionally, La Casa Nueva, a 1920s Spanish Colonial Revival mansion noted for its architectural crafts, was built by the Workmans' grandson Walter Temple and his wife, Laura. Additionally, El Campo Santo, one of the region's oldest private cemeteries, contains the remains of Pío Pico (the last governor of Mexican California), and other prominent pioneer families. Being a huge fan of Spanish and Spanish Colonial Revival architecture, I'll share some of the highlights of La Casa Nueva or the New House. The main entry with its central, open plan is impressive and filled with hand-crafted details like carved vegas, wood floors, and tiled stair risers. The main entry is filled with bespoke details of Spanish colonial revival architecture. A grand staircase with Spanish tile and tile floor molding in La Casa Nueva. As you discover the grounds, with your guide, you'll also find some unique rooms like this barbershop embellished with cement tiles. 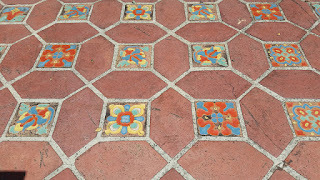 Cement tile such as this remind me of Cuban tile barbershops found in Havana during the same time period. Cement tile in the Barber Shop reminds me of handmade Cuban Heritage tile. A close-up detailing the cement tile pattern found in the Barber Shop. I'll continue with this amazing tour of La Casa Nueva in August. It's a feast of design details and tile - everywhere you go. Feeling inspired? 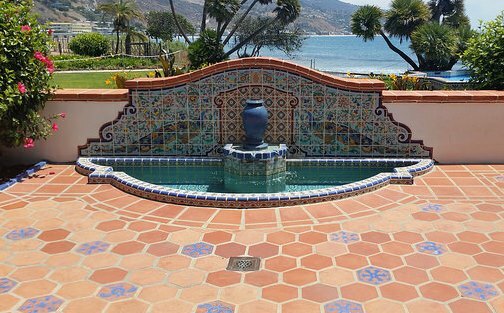 Want to learn more about how to use tile that create the style and feel of Spanish and Spanish Colonial Revival architecture? This is one of our passions and we can help. Visit our Spanish Tile Design Center today! 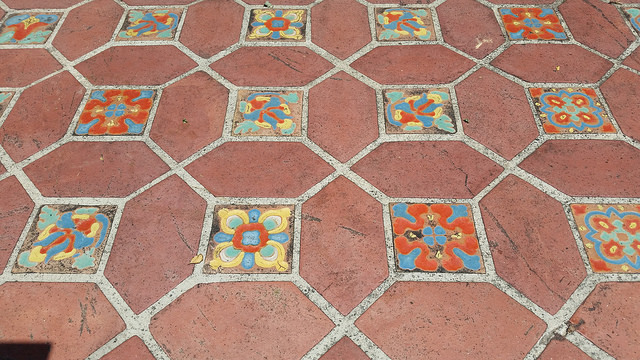 Cement tile floors for outdoor patios or indoor living spaces allow you to create unparalleled visual appeal using patterns together with the colors of your choice. Here are a few recent projects that I've been working on with customers. 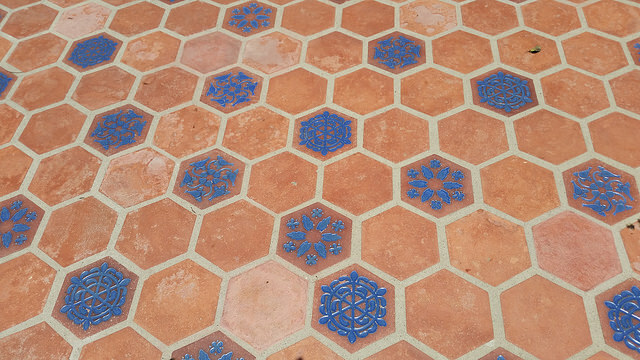 Each project shows how cement tile is being used to create flooring that is both personal and unique. Celebrate summer and be reminded of the cool water at the seashore with the Wave pattern by Tania Marmolejo from our Artist Series. Desiring a casual look for their floor, one of our Southern California customers chose the hip, contemporary and stylistic Wave pattern. Selecting their own colors, Stormy Blue and White from the Heritage Palette, they customized the pattern for their design at no additional cost. Durable and easy-to-maintain, cement tile is a great choice for floors. Not only is the look cool, casual and comfortable; but, the silky feel of polished cement tile on bare feet is a perfect choice for an outdoor patio or bathroom. The larger 10" x 10" cement tile format laid from wall to wall without a border. provides eye-catching appeal for contemporary homes. Capitalizing on California's great year-round weather, many of the state's homes wrap around a backyard patio that can be accessed from the bedroom, kitchen and living areas. A customer in Santa Monica has a traditional Spanish-style home with a central back patio. She wanted to tile the back patio and establish a casual, contemporary look that would work with the home's traditional architecture. She achieved her vision by using the Union 1A pattern by Tania Marmolejo, also from our Artist Series. To achieve a slightly more traditional feel for this outdoor patio, the pattern was framed to make a rug using Ash Grey. The area outside the rug will be filled with Dark Shadow. Both Ash Grey and Dark Shadow are colors from within the pattern. The interlocking circle pattern plays well with the classic Moorish-inspired, Spanish theme of the home's architecture. The soft and dark grey color palette is easy to work with and complements the existing design. Another Avente customer wanted to maintain a traditional, slightly more formal look for their entry hall. Working with patterns and colors from our Mission cement tile collection, they created a complex tile rug pattern with a border. However, since the rug will be laid in a polished, cut, poured concrete slab, only two colors from the grey-scale were used. Moreover, our same customer also liked our Cuban Heritage CH110-2B and choose the pattern for a different area of their home. The popular CH110-2B Cuban Heritage cement tile pattern uses shades of blues, grays, and dark brown. Unfortunately, the customer didn't have any blue in their existing design, so they changed the pattern colors and substituted Cana Green for Royal blue in the pattern. As you can see, designing with cement tile is fun and personable. I can't wait to see the installation photos from these customers after their tile is delivered and installed. These recent projects from our customers illustrate how flexible cement tile is with any decor or environment. You can create flooring designs for outdoor spaces, such as patios and walks, or interior spaces such as entries and kitchen floors. Cement tile works with the existing architectural elements from traditional to contemporary. You can use our existing designs and colors in the catalog, modify the colors in the pattern, or mix or match patterns and borders to make your home your castle. The choice is yours! Feeling inspired? Want to learn more about cement tile design, cement tile flooring, cement tile patterns, and see installations? Let us help! 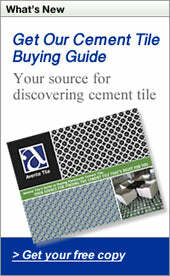 Visit our Cement Tile Information Center. Stunning view of the Malibu coast from the historic Adamson House. Situated in one of the most sought after coastal locations on the West Coast in Southern California, and perhaps the nation, is the Adamson House. Now a museum, the Adamson House occupies land that was previously home to the Chumash Indians until the 18th century. Later, according to Malibu Adamson House Foundation (MAHF) records, “the Rindge family owned 17,000 acres and 20 miles of coastline.” With the coast on one side and the Santa Monica mountains on the other, “the Rindge family’s daughter, Rhoda, and her husband, Merritt Huntley Adamson, used the site to construct a beach house, now the historic Adamson House museum. A closer look at the blue-glazed Malibu with terracotta tiles at the Adamson House. Moreover, the Spanish Colonial Revival style home, built in 1929, enjoys the designation of being a National Historic Site, California Historical Landmark, and a California State Park. “Situated near the Malibu Pier between popular Surfrider Beach and the Malibu Lagoon, the house boasts an exotic mix of Spanish and Moorish influences with dazzling displays of decorative tiles and one-of-a-kind craftsmanship including hand-carved doors, hand-painted frescoes, molded ceilings, distinctive cast ironwork and lead-framed bottle glass windows,” the museum added. 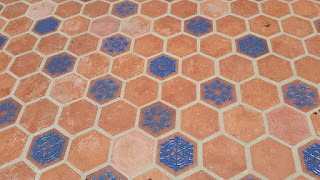 Malibu glazed ceramic tiles meld beautifully with terracotta tiles along the walkways of the Adamson House. Interestingly, California was inundated with tile-producing companies in the 1920s, including Malibu Potteries, the company founded by May Rindge. “Filled with an entrepreneurial spirit, May Rindge started the firm after discovering her land was rich in the natural resources needed to manufacture ceramic tile. She wisely hired Rufus Keeler—a ceramist and draftsman whom many considered a ceramic genius for his secret glazes known for their color and clarity—as her plant manager,” according to the MAHF. Thankfully, the tradition of creating colorful, decorative and long-lasting tiles similar to those found in the Adamson House remain strong with our latest introduction, Malibu with Terracotta Ceramic Tile. Vibrant colors coupled with Spanish- and Moorish-inspired patterns make our Malibu with Terracotta Ceramic Tile collection a feast for the eyes. This line of hand-painted ceramic tile pays homage to the Malibu and Catalina Potteries of California of the 1920s. Using classic patterns, these tiles are created using the cuerda seca technique to produce a slight relief and outline around each pattern color where the glazes pool. These tiles differ from our decorative ceramic Malibu tile line because the design utilizes unglazed terracotta or bisque for the background for a traditional Spanish look. Mix and match plain field tile colors from our Malibu Field to create harmonizing designs. The Malibu with Terracotta Ceramic Tile collection is suitable for all indoor applications, including walls and floors. They are also suitable for outdoor locations in frosty environments. Browse our Malibu with Terracotta Ceramic Tile here! With school out for the summer, and our dreams of upcoming summer adventures coming to fruition, we chose the Pinterest board that best reflects this exuberance – Summer Food and Fun! Summer’s energy translates to taking on new projects, perhaps one that has been set aside for years. Replacing cracked or broken pool tile or finally installing that fountain or water feature you’ve always wanted for the garden, and perhaps adding Malibu Ceramic Tiles with Terracotta to an indoor or outdoor set of stair rises. Using handmade or hand-painted porcelain tile for your next outdoor or indoor project will not only enhance the look of your home, but you can rest assured the tile you choose will withstand the elements, too. 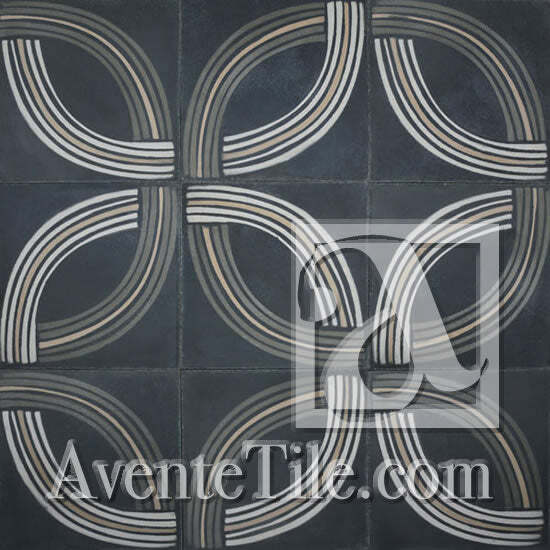 For whichever project you choose to conquer, Avente Tile is here to help you reach your design goal. Our extensive ceramic tile Design Idea gallery features a large collection of projects dedicated to inspiring you and your living space. How can we help inspire you today?